Korean superstar Lee Min Ho was voted by fans as the No. 1 “Asian male god” in a poll conducted by Chinese news site www.ddyule.com. The actor garnered a total of 10,013,151 votes to top the poll, in which he was also the sole nominee to breach the 10 million votes. Recently, Lee Min Ho met Korean President Park Geun Hye when he attended the 3rd Presidential Committee for Cultural Enrichment conference on Hallyu, or Korean Wave. The actor, the only Korean star invited to the conference, spoke about his experience as a hallyu star. Last January, Lee Min Ho attended the CCTV TV special “New Year’s Gala” in China, making him the first Korean celebrity to grace the show. Meanwhile, four members of boy band EXO M made it to the Top 11 list. 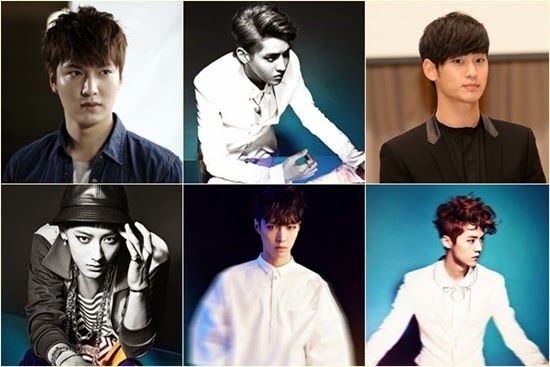 EXO M’s Kris ranked second with 9,990,158 votes followed by Korean actor Kim Soo Hyun, who garnered 9,963,038 votes. Lee Min Ho and Kim Soo Hyun are very popular in China. Kim Soo Hyun’s last Korean drama ,”You Who Came From The Stars,” was sold to China to become a huge hit. EXO M’s Luhan ranked fourth with 9,942,790 votes. Taiwanese singer and actor Show Luo placed fifth with 8,838,297 votes; followed by Hua Chenyu, who became the champion in the Chinese singing contest “Happy Boy” last year, with 7,866,924 votes; and Taiwanese singer Vincent Chiao with 7,818,811 votes. Hong Kong actor and singer Wallace Chung ranked eight with 7,583,028 votes followed by “Meteor Garden” star Jerry Yan with 7,551,631 votes. EXO M’s Lay ranked 10th with 7,463,492 votes and EXO M’s Tao ranked 11th with 7,394,862 votes. The voters ranked the stars based on looks, body and talent.